Overall Print Size: 33" x 25"
In the months that followed Dunkirk, the Royal Air Force alone stood against the might of the Luftwaffe and the massed forces of Germany preparing to invade Britain. While America anxiously watched events, some 240 pilots made their way to England to join the RAF in their herculean struggle against the overwhelming odds. Volunteers to the man and motivated by the urge to fight for the cause of freedom, and a pure love of flying, this happy band of warriors set standards of courage, skill, and fortitude that today are legendary. They were the American Eagles. Arriving in a foreign country determined to fly and fight a war not really their own, these brave young men became a symbol to the beleaguered British, and their selfless participation and sacrifice gave them a special place in the hearts of the British people that will remain for ever. Armed with log books often wildly overstating their experience and with convincing lies about their ages, they were welcomed into the RAF and quickly demonstrated the same determination that carried the pilots through the Battle of Britain and on to the Fighter Offensive in 1941. Their standards were high, their reputation in battle unsurpassed, but the price they paid was high, one third of them never to see their homeland again. By the spring of 1941 enough American volunteers were battle-ready, and No. 71 Squadron, RAF was formed to give the Eagles their own fighting unit. By the autumn two more squadrons, 121 and 133, were formed and during October and November of 1941 the Eagles had the distinction of being the top-scoring squadrons in the RAF. Robert Taylor's "EAGLES PREY" commemorates the 50th Anniversary year of the formation of the Eagle Squadrons. 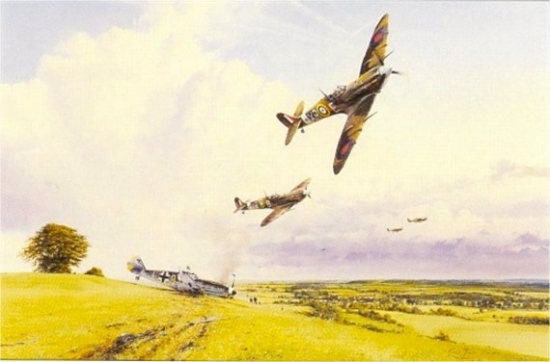 Featured are the Mk Vb Spitfires of No. 71 Eagle Squadron as they race low across the French countryside after a combat with Luftwaffe fighters over Northern France in 1941. Lying prey to the Eagles is a Me109 brought down during the dogfight, the lead Spitfire pilot clearly seen in the painting glancing down at their victim as they dash for the Channel and home.